Oktopost Review: "A Simple, Feature-Rich Social Media Posting Tool"
We use Oktopost across all of our media outlets to help schedule and manage different social media campaigns. It has helped us to keep all of our social media accounts in a single place and allows us to better view and manage different campaigns which allows us to keep better track of how each program is doing and how each outlet is performing overall. I think the interface navigation could use some better explanation of what everything is, but it is still easy to use once you are used to it. There aren't a ton of issues I've had with Oktopost. It really does what I needed it to do. Oktopost is great if you have several Social Media profiles you want to manage and want to schedule and post all your things in a simple interface. They have a great calendar view that shows everything that is coming up and you can easily move or change postings with a few clicks. It is also good for managing a single account. It has all the features I need for our single account markets, like campaigns, tracking, scheduling, etc. I think if you are trying to manage a very large number of social media profiles it might get a bit difficult. There are tools more suited for that than Oktopost that may be easier, but Oktopost would still work. User Review: "It's OK to Post with OKTOPOST"
We recently deployed it and rolled it out to a small subset of the company- top influencers. We had another solution previously but wanted a richer gamification experience for the users and also integration to marketo and more thorough analytics. Simple way to communicate social pushes to the employees and partners to help get the word out there. Not really an issue with Oktopost, but would be nice if linkedIn opened their API to allow us to measure the impact of linkedIn posts via social. It's hard to say right now, we're a medium sized business and it seems like a great fit for us. Not sure of the scale to a large enterprise. Oktopost Review: "save yourself a headache !" Oktopost was used by the strategic marketing team - mainly about 5 of us on the digital subteam. We were responsible for social media posting across the company - utilizing mainly Twitter and LinkedIn but occasionally on Facebook. It was used only by our team but we posted on behalf of the company handle, so the use was widespread. It addressed the business problem of low social engagement and disjointed efforts across multiple handles that had been randomly created and rarely used by certain departments. An all-in-one platform that organizes all content across multiple accounts. Provides consistent user experience help, representatives were quick to schedule phone calls or walk-throughs whenever we had issues. Easily accessible by the entire team, don't have to rely on one person to do everything or avoid being in the platform simultaneously. Sometimes there were bugs in the user experience, but they seemed to be quickly addressed. They didn't seem to have experience dealing with large-scale company use when integrating with Eloqua information. We had a lot of issues with false data or form submits showing up. It's well-suited when used by a team who is actively engaged in social media presence and sees the value of an all-in-one, team-accessible solution. 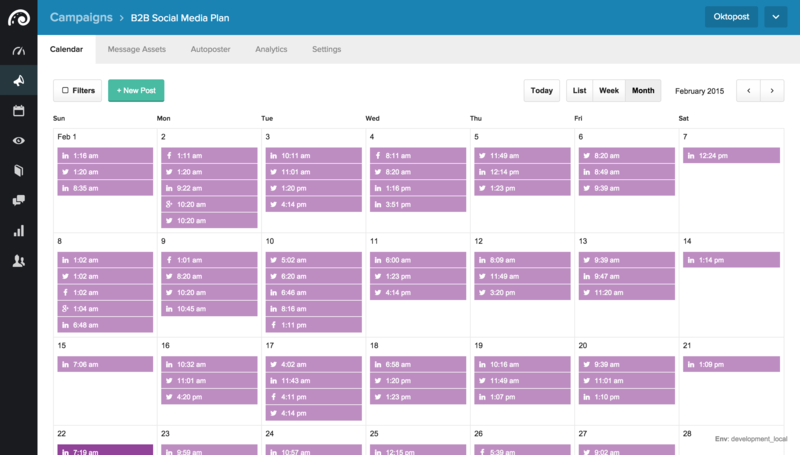 It's helpful that it serves as a scheduler but also can provide detailed analytics. I would avoid the product if it's a Hail Mary to get executive buy-in or engagement on social media - I think it just confused people who weren't already familiar with how social marketing works and they became disengaged and never used it. Review: "If you can afford it, Oktopost is incredible." We use Oktopost to schedule, distribute and analyze all of our social media posts. I personally set up the account(s) and our profiles. We also use it for event promotion. The integration with Feedly is perfect for us, because we produce so much original content and I can find it all in one place. Ability to organize and post across multiple platforms. In depth (best) analytics I have ever seen for a social media distribution platform. Social sharing abilities for other members of our organization. The automatic emails it sends to our employees letting them know there is fresh content for them to distribute is fantastic. It was a bit frustrating connecting with their sales rep who was overseas and had internet problems more than once. I think the set up for the way you tell Oktopost when to distribute (for the Queue) is clunky. I am struggling to come up with a third. This company is top notch. I absolutely love their platform. Maybe, I would say it takes some getting used to the platform, but that is going to hold true for nearly any company. We had over 50 social media accounts to set up and had to choose which ones we were going to leave out. If you have as many accounts as we do, it's worth the incredibly high price tag (I just noticed they hiked the prices substantially). If you don't have that many accounts, you need to do the math to see if it makes sense for you. $400/month for the basic service is steep. There are many less expensive platforms available. 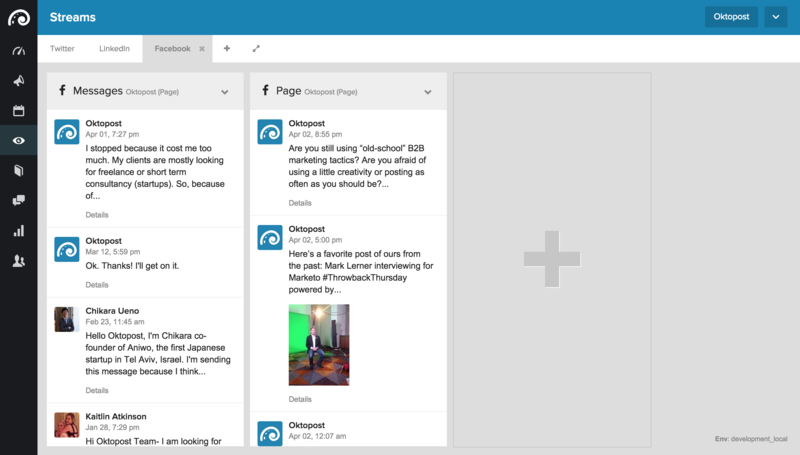 Oktopost Review: "Engaging Socially? The Best Balance Of Capability, Usability and Affordability for Social Engagement Platforms"
Oktopost is a business-centric social engagement platform that provides organizations with the capability to listen, learn, and share on leading social media networks from a single web-based interface delivered securely via a SaaS model. At ComplexDiscovery I am using Oktopost as the core social engagement platform for both my organization’s social media engagement (Corporate Communications) AND for client social media programs (Agency Model). Having utilized multiple social media platforms with capabilities ranging from individual B2C support to agency B2B support, I have found Oktopost to have the best balance of functionality and focus. 5) Robust Analytics (General and Specific Analytic and ROI Information). Autoposting: Allows users to easily schedule messages to multiple networks and social profiles. This was the capability that led me to Oktopost as its ease of use and comprehensive calendar view allowed me to manage complex social media programs in a time efficient manner. Integration: Allows users to integrate social media efforts with key marketing/CRM platforms to include Act-On, Marketo, Eloqua, and SalesForce. Integration allows users to translate metrics into actionable information for shaping all marketing efforts. Social Streams: Ability to view and act on all social media networks and individual user profiles allows users to manage all social media activities from within a single web-based browser environment. 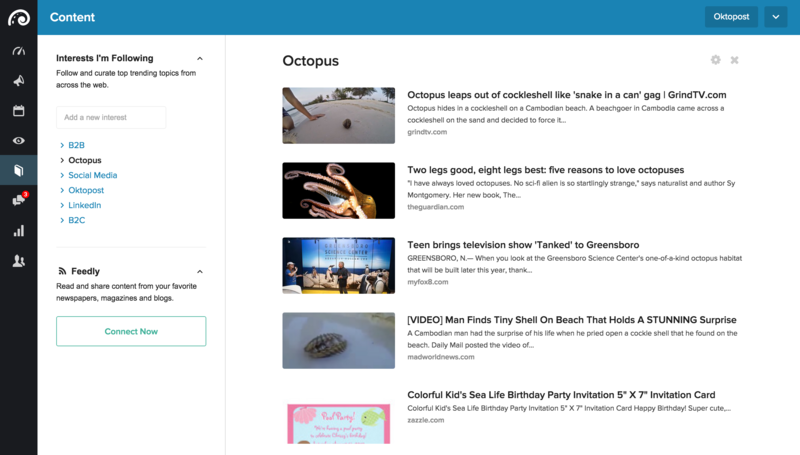 Content Curation: Integration with Feedly coupled with strong search capability allows users to discover and curate top trending topics from across the web. Advocacy Board: Unique capability that expands the use of Oktopost across an enterprise by allowing invited colleagues to share trusted content created and shared within Oktopost. Advanced Metrics: Detailed metrics provides users the ability to translate activity into understanding. Intuitive reporting function also allows for the creation and sharing of professional reports with clients and users. Increased integration with supported social networks and expansion of support beyond current supported networks. Streamlined authentication / re-authentication process. Ability to add sequencing parameters to autoposting capability. For systematic management of multiple accounts and individuals across multiple social networks in B2B and B2C environments, it is a preferred social engagement platform. If a user has decided they need a program vs. just a posting capability, they should consider Oktopost. Oktopost Review: "Excellent social media management system"
We're using Oktopost to manage client's social profiles, to tweet, retweet, share updates on LinkedIn groups and client's personal and company accounts and Facebook. It's used by our social media strategist and account managers. Easily schedule across all networks, including LI groups. 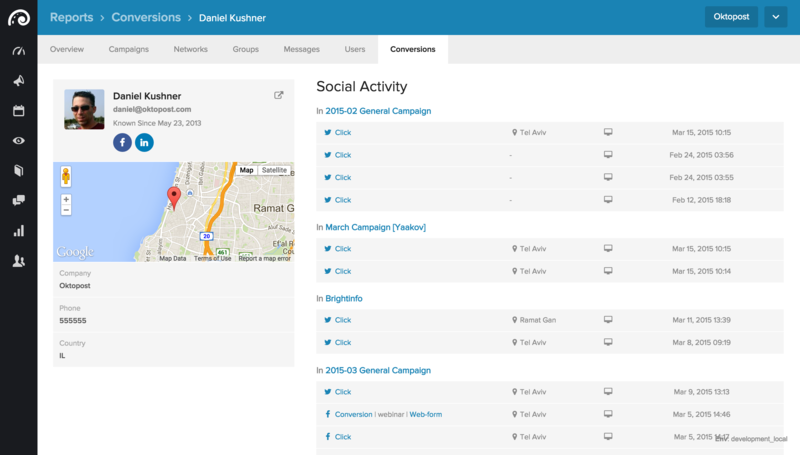 Analyze content by campaign/social network/LI groups. Calendar view by campaign or all, which give us a good view of the work we're doing that month. "Content" feature helps you find very relevant content and easily share it on any social profile. The main campaign overview is downloadable to PDF, but the reports by campaign is only downloadable as an excel file, would love that to change. I believe Oktopost is well suited for an in-house social media manager, as well as for large agencies. Oktopost has made our social media program execution possible utilizing the least amount of resources possible and yielding a very high level of returns. It's usage is intuitive and constantly being tweaked (improved) in a common sense approach. Oktopost allows us to use it as a shotgun or with surgical precision. The program allows us to meet the goals of specific programs without the resources "other" competitive programs require. I have found the customer service to be responsive and actually really nice people (I don't get that feeling from most company's customer service people who usually are reading from a script). The program does exactly what I want it to do at a price that I feel is fair. Make Google (G+) allow personal submitals through Oktopost. Let me make this clear, this is NOT an Oktopost problem, this is a Google problem!! But I put this down here because it is the only missing link to creating a total social media tool kit. When I first started there were very few support documents and learning resources. I think I was one of the first to sign up. Since then they have clearly been working on filling the learning center with information. Keep up the good work! If LInkedIn is important than Oktopost better be important to you! Review: "Oktopost has become essential for our social media management"
We use Oktopost to manage the automation of our Twitter and Google+ posting. It is being used by our editorial staff. It allows us to be more efficient and effective in managing our social media presence. The Message Asset and Autoposter feature are hugely useful for broadcasting content at different times. This allows us to reach our entire audience on Twitter and Google+, rather than just sending messages once. The support is outstanding. Anytime you have a question, it WILL be answered. The reporting feature has had a few bugs, but they were quickly fixed once pointed out. So long as social media is a driver of business results for you, this product is well suited for your needs. Oktopost Review: "Great tool - especially for employee advocacy"
We use Oktopost for content curation. It helps us simplify the posting of valuable content for our clients. We also use the Feedly, Startafire, and HubSpot integration. Another important element for us is the employee advocacy board. Now all of our staff members use it, and that has helped drive engagement. I think Oktopost works really well for teams or for companies that want to get their staff evolved in their social promotion in order to drive traffic. It's ideal for B2B companies, and I would say that you can't do most of the things oktopost offers with any other social management tools. Review: "Oktopost is a must for B2B social marketers"
Convenient post scheduling to all platforms, along with batch submissions to LinkedIn Groups. Social media lead generation monitoring. Lovely user interface with all of the information you need and none that you don't. The social inbox gives you a convenient dashboard for managing responses across all platforms — including replies to LinkedIn Group discussions. It's a little bit difficult to set up the social leads function. I wish the analytics dashboard was a bit more intuitive and robust. Absolutely — I recommend Oktopost on a daily basis to peers, clients, and on social media. It's affordable, easy to use and set up, and manages social media for B2B in a way I have never seen before. Review: "Oktopost is Hands down THE Preeminent Leader in B2B Social Media & Content Marketing tools to Get a Positive ROI"
Great scale for LinkedIn Groups by way of great distribution at once of relevant content you've created to many groups. Great insight knowing what LinkedIn groups are performing for you in the way what posts go through to what group, and which groups drive visits and which don't. That way you are not wasting time knowing which groups are effective or not. Oktopost tells you so you can be a smarter marketer! Love the inbox as it allows you to easily engage and manage responsed to your LinkedIn discussions. Love that it also has multi platform as I can put messages into many different social platforms and can see them on all the calender. Love the new bookmarklet! Can't wait to see how this evolves. If you are a B2B marketer, Oktopost IS the BEST solution for your content marketing and social media marketing needs HANDS DOWN. Managing the linkedin API throttle limits is VERY tough for ANY company. Oktopost will have this issue moving forward, and they have had issues with some posts going through, but they always let you know if there was an error and they work to fix any issues immediately. The new bookmarklet, although just new, can use some multi-platform pushing capabilities. If they can figure out Google+ communities distribution like they did for LinkedIn groups that would also be awesome! But, Google is pretty strict on APIs, so not sure that is even possible. If you're a B2B and NOT using Oktopost, you aren't doing B2B social media and content marketing effectively enough. I guarantee you are losing resource to time wasted on distributing content and what groups work and which ones don't on LinkedIn. Oktopost Review: "Great for B2B Social Media Management"
Publishing and scheduling though Oktopost are very easy, whether it is a one-off post or an entire campaign. SFDC and Marketo integration - leads generated from social media are pushed right into our other marketing and sales tools. The listening in Oktopost is lacking; we are only able to track conversations that we have initiated. Oktopost is a great tool for small/medium enterprises, as well as marketing agencies. Oktopost Review: "Great platform, great service!" Oktopost is the main social distribution platform with which we work on behalf of almost all of our clients. It allows us to promote for our numerous clientele in an automated manner that is user-friendly and has trackable stats and conversion reporting. Auto-poster feature that allows scheduling of posts to be made in relatively short time. Calendar view has a great UI with easy to use drag and drop and editing features. Message assets can be saved per campaign without having to re-draft them for repeated promotions. It is most suited for businesses that require a medium to high level of promotion and distribution and where tracking is required. It is also very suitable for campaigns that require lead tracking and conversions. 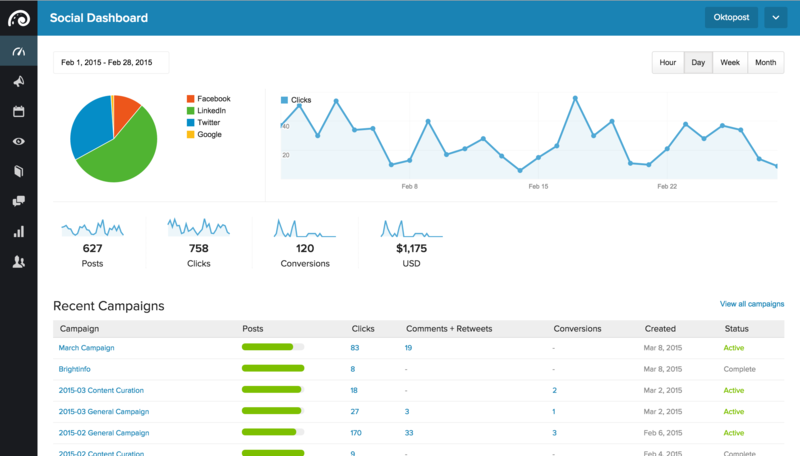 Oktopost is an end-to-end social media management platform, designed for B2B marketers. Oktopost offers detailed analytics on how social drives traffic and leads, and integrates to all major marketing automation platforms such as Act-On, Hubspot, Marketo, Net-Results, Salesfusion and Pardot. This platform also offers an employee social advocacy platform. Customers use the Oktopost Advocacy Board to increase their social reach above and beyond the company’s social network. The vendor says that Oktopost is trusted by organizations of all sizes, from start-ups to global enterprises, as the most robust platform that matches their unique B2B requirements.